Featuring Our Hernando County Commissioners, Sheriff & School Board to Light the Grand 9 Foot Menorah. Enjoy the Phoenix Fire & Art showPerformance, includes a team performance of fire breathing, fire and LED magic, fire dragon staff, fire and LED fire levitation wand,and acrobatics. Mesmerizing, entertaining and fun for all ages. 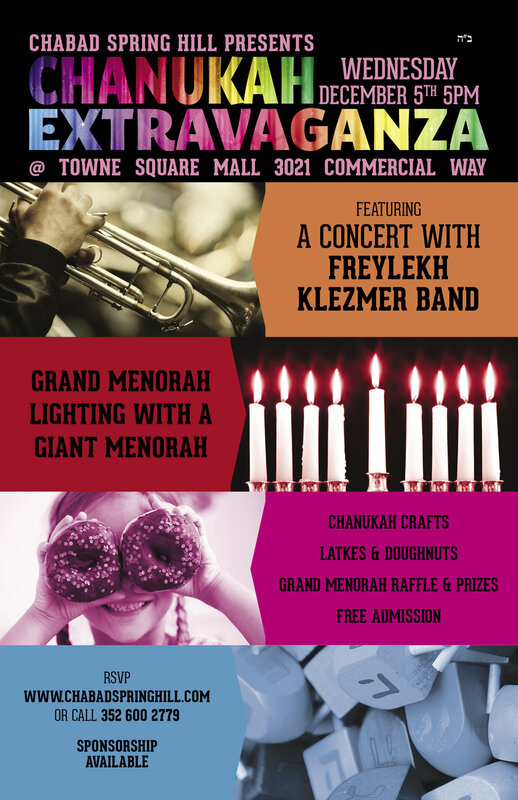 Also featured will be music, Create Your Own Menorah to take home, Arts N Crafts, Hot Latkes, Donuts, Menorah Raffle & Other Prizes, celebrating the joy of Chanukah will be an experience to be remembered. The highlight of the event will be the Grand Menorah lighting, where prizes will be raffled off for all attendees of the lighting ceremony. All children will receive Chanukah Gelt of one crisp dollar bill. Featuring "Magic Man Van Valin", Arts N Crafts, Hot Latkes, Donuts, Menorah Raffle and more.